Sand is usually composed of mineral grains. You’ll find a post about the sand-forming minerals here. Sand itself is not a mineral. It is a sediment just like clay, gravel and silt. Most common sand-forming mineral is quartz. There are two good reasons for that. Desert sand composed almost exclusively of rounded quartz grains. Sand sample is from the Sahara Desert (Erg Murzuk), Libya. Width of view 15 mm. First, quartz is very important rock-forming mineral. It occurs in many igneous rocks, especially granite. It is also very common component of many metamorphic rocks (quartzite containing little else than quartz). And finally, quartz is a major component of sedimentary rocks, especially sandstone. As these rocks weather and disintegrate, quartz crystals are liberated as sand grains. Another reason why quartz is so widespread in sand is its extreme resistance to weathering. Weakly acidic rain water does not dissolve it effectively and it is also fairly resistant to abrasion. Despite all of this, quartz is very rarely a sole component of sand. It is accompanied by very many mineral species. First group of them are in sand because they are simply very abundant in rocks. Second group of sand-forming minerals are almost never abundant as rock-formers, but they are, just like quartz, very resistant and therefore their concentration in sand slowly rises as time goes by. First group contains such widespread minerals as feldspar (more than 50% of the Earth’s crust is composed of feldspars), pyroxene (11% of the crust), and amphibole (5%). They are all mineral groups with a varying chemical composition, unlike quartz, which is a single mineral with definite and very simple chemical composition (SiO2). These minerals, when attacked by weathering agents, relatively quickly disintegrate and they mostly become particles of clay. If we imagine granite, a typical and widespread igneous rock, roughly one third of it is composed of quartz and two thirds is feldspar. When granite disintegrates, quartz becomes sand grains and feldspars are turned to clay. That is the very reason why we have so much of these two sediments and their usually unpleasant mixture with water which we call mud. Second group consists of sand minerals that are quite unimportant in rocks but remain in sand fraction for a very long time. Such minerals are for example zircon, tourmaline and rutile. Here are some sand-forming minerals: olivine (least resistant), pyroxene, andalusite, sillimanite, amphibole, epidote, sphene (titanite), kyanite, staurolite, chlorite, spinel, garnet, apatite, rutile, tourmaline, zircon. Olivine disintegrates so quickly that we don’t know consolidated sediments older than Quaternary (last few million years) that contain it while zircon grains are the oldest minerals ever found on Earth. Some are almost as old as the Earth itself. Heavy mineral sand from Sri Lanka which contains lots of different minerals. Width of view 20 mm. Sand is a very versatile mixture. We have much more than mineral grains in its composition. Third large and versatile group are lithic fragments. They are simply stones that have the size of sand grains. Common rock particles in sand are basalt, granite, schist, sandstone, and limestone which are all very common rock types as well. Therefore we can conclude that stone or rock fragments are an indication that the particular sand sample is not very mature. Otherwise, rocks would have had enough time to disintegrate into single minerals. 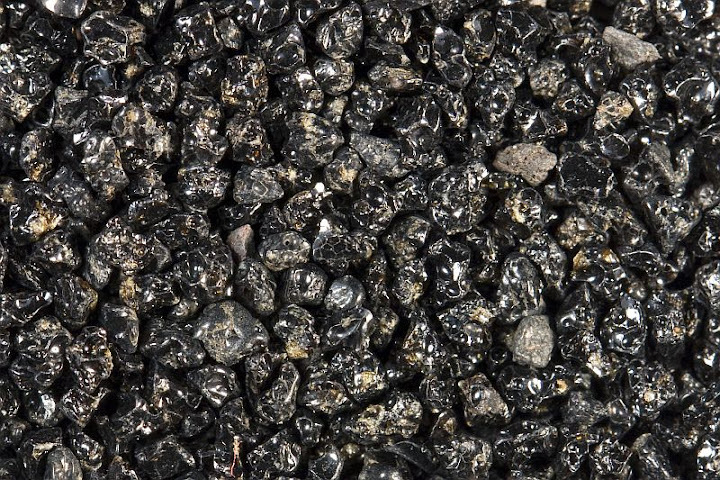 This sand sample is composed of volcanic glass (rock fragments) from Punalu’u Beach, Hawaii. Width of view 20 mm. Fourth important component of many sand types are biogenic fragments. Many marine organisms build hard shells or tests which become sand particles after these organisms die. Most common sand producers are foraminifers, bivalves (clams), gastropods (snails), corals, sea urchins, etc. They are common in low latitude warm sea water, but many species exist in colder water too. In some regions they are so widespread that most beaches are almost entirely composed of these biogenic fragments. Coral sand from Bermuda. Pink fragments belong to foraminifera. Corals are light-colored. There are also some molluscs and even echinoids (sea urchin spine in the lower left). Width of view 32 mm. 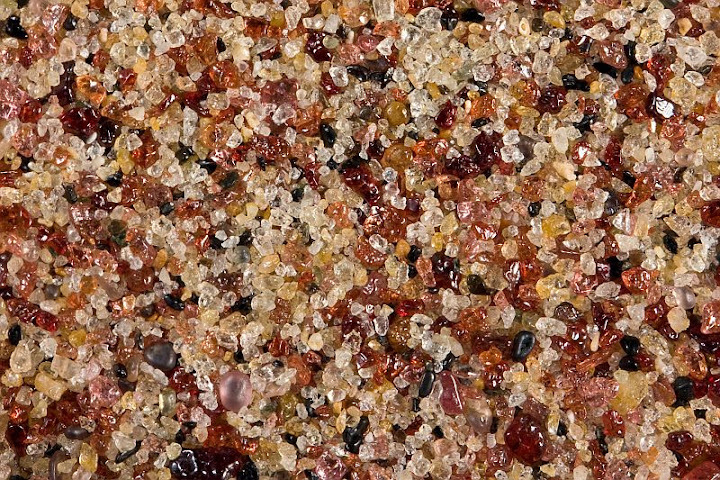 Fifth component of sand are artificial or manmade objects like glass and concrete fragments and plastic pebbles. 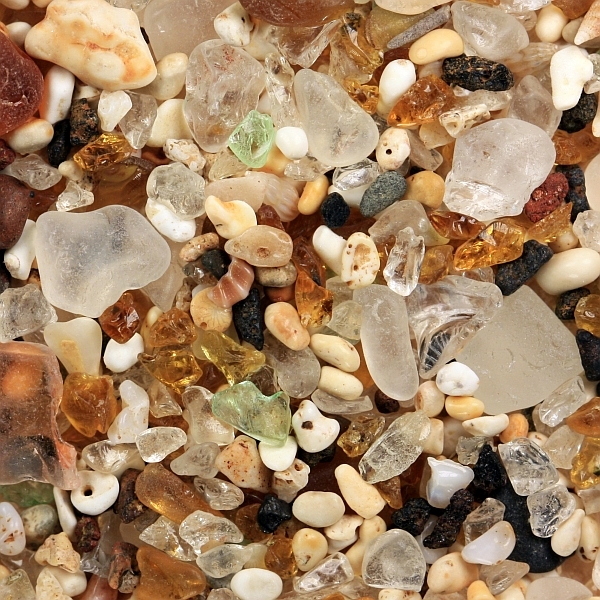 Definitely we don’t like the growing presence of such sand types although I have to say that some glass sands from former garbage dumps are pretty beautiful and definitely valued as a curiosity by many sand collectors. 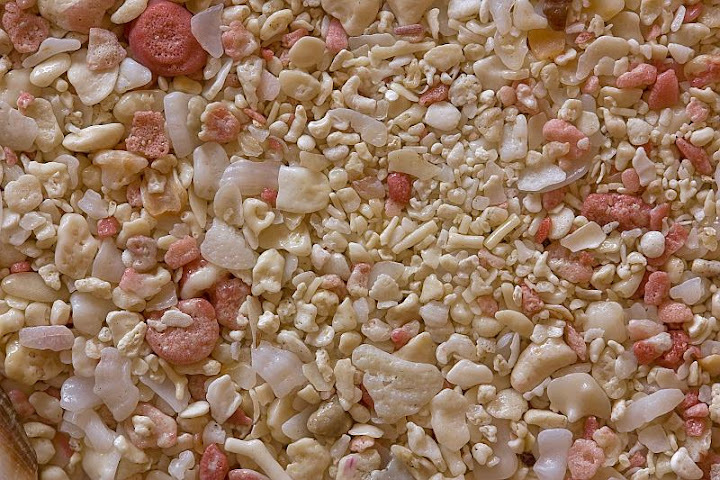 Sand composed of lithic fragments and rounded pieces of colorful glass. Glass Beach, Kauai, Hawai’i Islands. Width of view 20 mm. Pettijohn, F. J., Potter, P. E. & Siever, R. (1973). Sand and Sandstone . Springer. Siever, R. (1988). Sand , 2nd Edition. W H Freeman & Co.
My collection of over 6,000 samples. I have much material to change. Are you interested in doing an exchange? I’m not the owner of this website, but i saw your comment about change samples of sand. What do you think about we change samples? I’m brazilian and i have many samples of sand of São Paulo, some of North of Brazil and other places. Does sand break down any finer and then disentigrate? Yes, it gets finer silt/dust which can be deposited as part of mud or loess.